Arawak Expeditions is a small, family-run outfitter based in St. John, U.S.V.I. 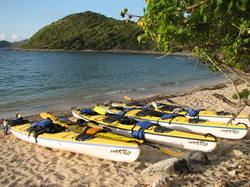 Now in our fifteenth year of operation, we were the first company to offer sea kayak tours on St. John. We are proud of our record and our experience, and we are fully licensed to operate kayaking and biking tours in the Virgin Islands National Park on St. John. Our mission is to provide safe, enjoyable expeditions while having the least impact possible on the natural environment. We strive for the best. We use the highest grade equipment available, provide the finest outdoor cuisine, and chart the most exciting trip itineraries.